Scientist divide mitosis into four parts which are prophase, metaphase, anaphase, and telophase. 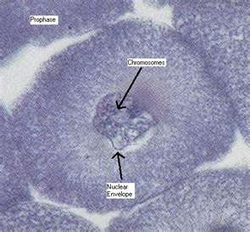 During prophase, the thread line chromatin in the nucleus condenses to form double-rod structures called chromosomes. each chromosomes has two rods because the cell’s DNA has replications and each rod in a chromosome is an exact copy of matid. The dna molecules shorten and condense by coiling to form chromosomes. chromosomes become more coiled and can be seen under a microscope. Each duplicated chromosome is seen as a pair of sister chromatids joined by the duplicated but unseparated centromere.